Why use the Mega III? Functional: The Mega III has been designed to be a lightweight, yet highly rigid platform for the vast majority of film cameras. It has sufficient power to swiftly manoevre a camera with a large zoom lens. With sliprings in all 3 axes, the camera is free to move without snagging wires. 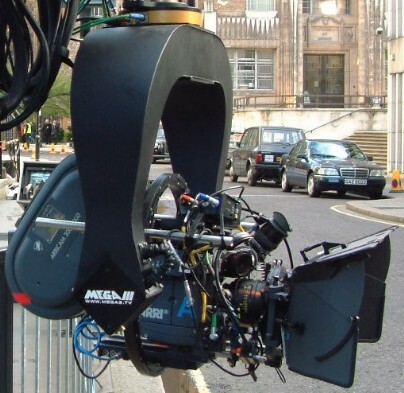 Efficient: Set-up time has been known to be as little as 10 minutes from arrival of the equipment on set to "Action" being called. The system has been very highly specified - reliability is a key factor of the system's design, and most of the major working parts can be easily swapped should it be required. Control: The custom-designed control system of the Mega III has an extremely intuitive functionality such that operators feel confident when operating or adjusting the system. Precise: The Mega III is also known for its precision, such that the operator is confident that the camera is always where they want it. There is no drift, and the head checks its position over 300 times a second to ensure utmost accuracy, with pan and tilt encoding of over 2,500 counts per degree of head movement. Post Production: Recorded moves can be stored to PC either for re-playing at a later date, for storing multiple moves, or for output to MAYA or compatible packages. This makes tracking the position of the head very simple. The operator has the position indicated on an "at-a-glance" graph, along with a precise numerical readout. Military-approved aircraft-quality connectors have been widely used throughout the system, and metalwork is hard-anodised aluminium and stainless steel construction where possible. The drive systems utilise zero-backlash gearboxes.